The agreement is pro-owner in tone, and specifies the compensation to be paid to the manager as a percentage of the development costs of the new center. The agreement also sets forth in considerable detail the management and development services the manager must provide during the term of the engagement. The agreement does not include leasing duties for the manager, which would have to be provided by separate agreement. Features Manager, among other things, is required to supervise outside contractors, to file tax returns relating to the property, to keep detailed books and records, to obtain insurance, to provide bookkeeping services relating to the project, to maintain the common areas of the property, to negotiate service contracts, to negotiate utility agreements, to comply with the terms of credit agreements entered into by the Owner for the project, to comply with applicable law concerning the project, to obtain necessary building permits and other permits, and to retain consultants. 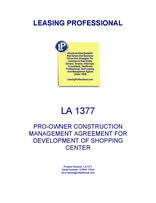 THIS CONSTRUCTION MANAGEMENT AND DEVELOPMENT AGREEMENT dated as of the _____ day of __________, _____ (the “Management Agreement” or the “Agreement”) between COMMERCIAL PROPERTY LANDLORD, INC., a __________ corporation, (“Owner”) and AGREEABLE MANAGER, INC., a _______ corporation (“Manager”). Owner hereby appoints Manager, on the conditions and for the term hereinafter provided, to act for it in the operation, maintenance, management and development of the property identified on Exhibit A attached hereto and made a part hereof (the “Property”), which management and development duties are more particularly described in Articles IV and V. Manager hereby accepts said appointment to the extent of, and subject to, the conditions set forth below. The term of this Agreement shall commence on the date hereof and shall continue until the date of Substantial Completion of the Property (the “Initial Expiration Date”) unless this Agreement shall be terminated and the obligations of the parties hereunder shall sooner cease and terminate, as hereinafter provided; provided, however, that the term of this Management Agreement shall automatically extend for consecutive one-year periods following the Initial Expiration Date unless Manager or Owner provides the other with written notice, at least six months prior to the beginning of any such additional one-year period, of its election to terminate this Management Agreement. A. Owner shall pay Manager, as Manager’s entire compensation for the services rendered hereunder in connection with the management of the Property, a management fee (the “Management Fee”) equal to (i) $_________ per annum, payable in equal monthly installments, in arrears, in the amount of $___________ each on the tenth day of each calendar month beginning with the first calendar month after the date hereof. In the event that this Agreement shall commence on a date other than the first day of a calendar month or shall terminate on a date other than the last day of a calendar month, the installment of the Management Fee payable for that month shall be prorated for the actual number of days that this Agreement is effective in that calendar month. B. Owner shall pay Manager, as Manager’s compensation for the services rendered hereunder in connection with the development of the Property, a development fee (the “Development Fee”) (the Development Fee and the Management Fee are sometimes referred to herein, collectively, as the “Management and Development Fee”) equal to (i) five percent (5%) of the total Development Costs (as hereinafter defined) with respect to the Property, plus (ii) general overhead and administrative expenses equal to one percent (1%) of the total Development Costs with respect to the Property. Owner shall pay Manager, on account of the Development Fee, monthly installments (the “Development Installments”) each in an amount equal to the Specified Installment Amount (as defined below), with each such installment payable, in arrears, on the tenth day of each calendar month, beginning with the calendar month immediately following the date hereof. In the event that it is determined, upon Substantial Completion of the Property, that the aggregate Development Installments paid to Manager as of such date on account of the Development Fee total less than the amount of the Development Fee that is due to Manager hereunder in respect of the Property, Owner shall pay to Manager, within 15 days after Substantial Completion of the Property or upon the transfer of the Property to any unaffiliated third party, whichever is earlier, an amount equal to such difference. “Development Budget” shall mean, collectively, the capital budgets and development schedules setting forth the Development Costs to be incurred in connection with the Property, as prepared by Manager and approved by Owner and as more particularly described in Article V hereof. “Development Costs” shall mean the costs incurred by Owner in accordance with the Development Budget in connection with the planning, design and construction, and development or redevelopment of the Property, including, without limitation, fees of any construction manager, general contractor or any other third-party professionals unaffiliated with Manager and costs set forth in the Development Budget that may be reimbursed by tenants at the Property for improvements outside the leased premises of those tenants. Notwithstanding the foregoing, in no event shall Development Costs include costs paid for or reimbursed by the tenants for improvements inside the leased premises of those tenants, the Development Fee, costs of the land and, with respect to loans made to Owner, interest, commitment fees and points. “Specified Installment Amount” means $________. “Substantial Completion” shall mean the date on which (a) all punch list items and landscaping at the Property have been completed, (b) the planning, design, construction and development of the Property have been completed, as certified by the Owner’s architect, in accordance with the plans and specifications therefor approved by Owner, (c) all necessary occupancy and other permits have been obtained with respect to the work completed at the Property for which Manager has any obligation hereunder and (d) if leases are then in effect at the Property, the portions of the Property demised under the leases have been delivered for possession to the tenants thereunder in accordance with the terms thereof, the tenants have otherwise taken possession of the demised premises, or, if tenants cannot take possession due to Owner’s obligation to perform tenant improvement work, tenant improvement work has commenced thereunder. C. Manager shall receive no commissions, fees or other compensation (other than the Management Fee) in connection with any leasing or sale of any part of or the entire Property or the procuring of any financing or refinancing with respect thereto; provided, however, that nothing contained herein shall in any way restrict the commissions, fees and other compensation otherwise payable to any affiliate of Manager by Owner pursuant to the Retention Agreement. D. In the event that Manager desires to provide services not required to be performed hereunder (“Additional Services”) for the benefit of a tenant of the Property, Manager shall notify Owner in advance of its intention to provide Additional Services to a tenant or tenants where those services are substantial in nature. Owner shall have the right to prohibit Manager from undertaking such services, if, in its judgment, the performance by Manager of the Additional Services would adversely affect the professional relationship and duties of Manager created by this Agreement. 1. Preparing, or causing to be prepared at Owner’s expense, and filing all income, franchise and other tax returns relating to the Property required to be filed by Owner. 2. Keeping true and complete books of account in which shall be entered fully and accurately each transaction of Owner’s business relating to the Property. The books shall be kept in accordance with the accrual method of accounting, and shall reflect all transactions of Owner’s business relating to the Property. 3. Except as otherwise provided hereunder, procuring, at Owner’s expense and at the direction of Owner or the Owner’s insurance brokers or insurance advisors, any insurance required or desirable in connection with Owner’s business relating to the Property or the employees required to operate Owner’s business relating to the Property and errors and omissions insurance for Manager, under which Owner shall be the sole beneficiary. Manager shall not settle any claim for a settlement amount in excess of $100,000 without the approval of Owner. 4. Providing all general bookkeeping and accounting services required by the provisions of this Agreement at the expense of Manager. Any independent certified public accountant engaged by Manager shall be subject to the approval of Owner and all fees and expenses payable to such accountant shall be at Owner’s expense. Manager shall maintain separate books and records in connection with its management of the Property under this Management Agreement, which books and records shall be kept in accordance with generally accepted accounting principles. Owner shall have the right to examine or audit the books and records at reasonable times and Manager will cooperate with Owner in connection with any such audit. 5. Investing funds not otherwise required to pay the costs of day-to-day maintenance and operation of the Property or in the operation of Owner’s business pursuant to guidelines set by Owner. 6. Repairing, making replacements and maintaining the Property and all common areas at the Property and purchasing all materials and supplies that Manager deems necessary to repair and operate and maintain the Property, in order that the Property shall remain in good, sound and clean condition, and making such improvements, construction, changes and additions to the Property (including capital improvements), as Manager deems advisable, provided that Manager shall receive approval of Owner prior to undertaking any improvements, construction, changes or additions to the Property. Owner shall pay all fees, costs and expenses incurred by Manager in connection with the retention of outside contractors and suppliers for the performance of all repairs, replacements and maintenance of the Property in the event that Owner decides to remodel or extensively refurbish the Property, or any part thereof. Manager shall be entitled to receive additional compensation for services required to be rendered by it for services such as supervision of construction and allocation of overhead expense (i) to the extent that tenants at the Property reimburse Owner for such costs and (ii) if such costs are not reimbursable by the tenants and such remodeling or refurbishment shall be on a significant scale and shall require significant work by the Manager, the amount of such additional compensation payable to Manager shall be equal to Manager’s costs in connection with such work, plus twenty percent (20%) of Manager’s costs.